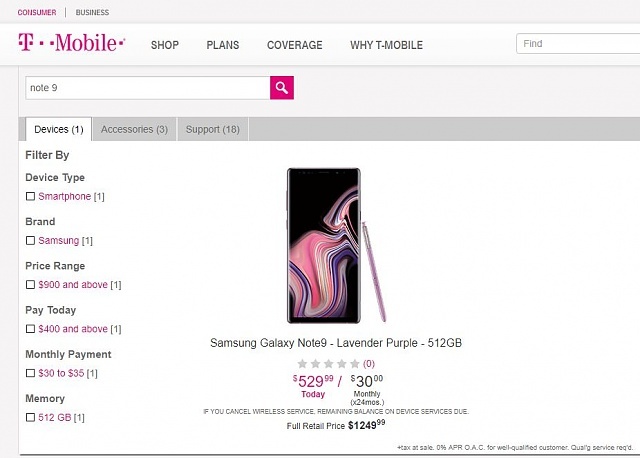 Decided to do a search on T-Mo website and look what popped up? Apologies if someone else posted already. Too cheap to be true? Possibly but can't imagine they'd waste time creating a fake search result. We'll know for sure in a few hours. I would imagine a down payment of over $500 will scare a few customers away from the 512GB version. $1,249.99 is cheap to you guys? Nope, but it's probably a lower price than many expect to see. Carrie Greicar and Nostromo79 like this. I don't see that on their site. Link? What country? I'm in the US and I don't see that on their site. US site. Can't get any detail on the phone, page isn't available, redirects to the list of phones currently available. Gary02468 and Nostromo79 like this. It's exactly in-line with what I had expected if indeed they were going to carry the 512GB Note9. It's the first indirect confirmation I've seen. It's slightly anticlimactic but gratifying at the same time. I don't believe that Note enthusiasts who want this model will balk. I'm not really surprised by the price, I know I've seen higher tossed around but thought that would have been a little crazy to go much higher than $1250. The people who are dead set on getting this model will absolutely pay the price. As a JOD user I won't, especially since I have no need for that much storage. Yes, I believe that they will. Almost out of 'spite'. Many times I have stated that if it were offered I'd buy it. So now I have to put my money where etc. Best wishes. Sales tax isn't included in that price. Nostromo79 and mgbosshogg like this. It's the $530 down payment that kills me. . It's not much but it's there. Seems to be under construction as might be expected. I also expect Verizon (my carrier) to offer the 512GB Note9. Haven't heard anything with regard to Sprint or AT&T. I like the idea of a 512GB phone, but I don't know if I want to pay that much for one if it'll be the same price as the one at T-Mo. I already feel stupid paying full retail price for a 256GB iPhone X ($1,149). For the utility of it I'll look the other way as to cost and hope to keep this phone for at least two years. Though it has been well over a decade, there were instances where I'd used the same phone longer than twelve months. I've switched phones four different times this year (Pixel 2 XL, iPhone X, S9+, Essential) so that's why I'm a bit apprehensive. I also have a problem with spending too much money on phones! Nostromo79 and nokia4life like this. Nostromo79 and shaimere like this. Me too. I had been going forward on the momentum of a new phone each year, often two a year circa 2012-2017, because my fiancée would get the latest phone each fall. I started it but she was pleased to have a new device each year. She was a bigger technophile than I was. They won't gather any moss that way. I lost all my Apps on my SD card. My phone is Samsung J2 prime. What should I do?